Powerful and easy-to-use photo editing software with a complete set of image manipulation tools. It lets the user retouch and enhance photos, change background, experiment with photo filters,add frames or masks, make greeting cards with 1000+ templates. Home Photo Studio is a powerful, fun and easy photo editing program offering a complete set of image manipulation tools. 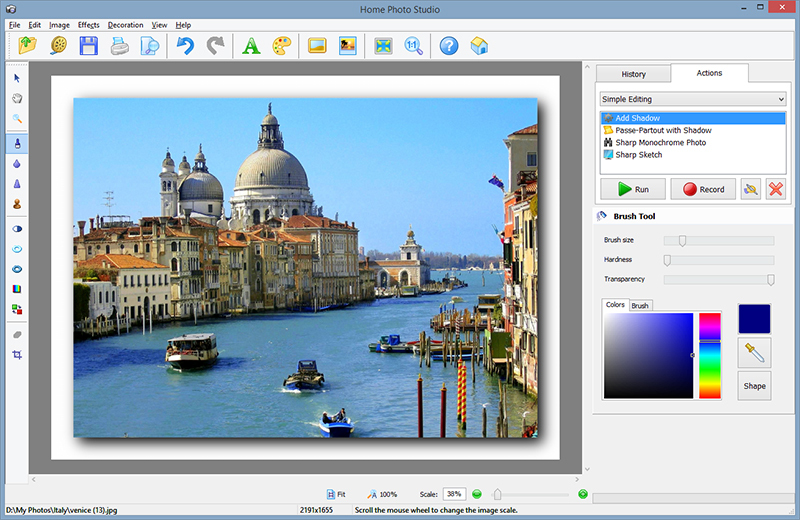 Thanks to a user-friendly interface and a detailed help system, the software is simple to learn but provides enough options to keep any photo enthusiast creatively occupied. With Home Photo Studio, it is convenient to view and edit digital shots. Retouch photos, enhance colors and adjust levels, remove red eyes, sharpen blurred images, change photo background... all of these changes can be made with a couple of mouse clicks. Multiple undo & redo feature is also there for effortless editing. Working with lots of images at the same time is made easy thanks to efficient batch processing. Besides, the user can create actions and then apply them to any number of photos at once. Home Photo Studio comes with hundreds of photo filters, special effects, and design templates. There is also a collection of picture frames in a wide range of styles. 1000+ gorgeous photo decoration templates can be used for creating original greeting cards. The convenient print module allows the user to print single or multiple photos. There is a wide selection of stylish print layouts in form of grid collages.